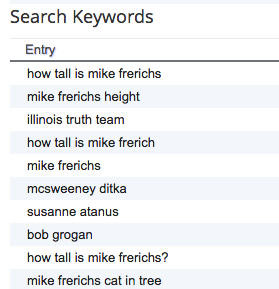 Here's the top 10 search terms that have come into the Truth Team recently. The majority of the traffic came to us in the last 60 days was via search. As you can see, we successfully intercepted lots of interested parties and shared the 'truth' with them. Content marketing is a 'long game'. It takes time to create the content, develop the authority, and connect with intended searches. With Mike Frerichs running his 'measure up' tv spot, we successfully introduced thousands of voters to the 'real Mike Frerichs' on the web.